"The entire experience was wonderful and so much easier than I thought! Preston took the dreams that we had for so long and turned them into reality. He made a house into the home we had always dreamed of for our family!" 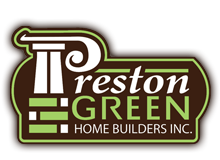 © 2012 Preston Green Home Builders, Inc. All rights reserved.